Every once in a while an email might fail to send, not get through to a recipient, or is just plain lost in the midst of a busy inbox. Or maybe that email was so fantastic you just want to send it again for fun? In these situations, you’d want to resend an email message, which is easily achievable in the Mail app for Mac OS and Mac OS X. This walkthrough will demonstrate resending an email in the Mac Mail app. You can resend any sent message for any reason you want, whether it was delivered or failed does not matter. 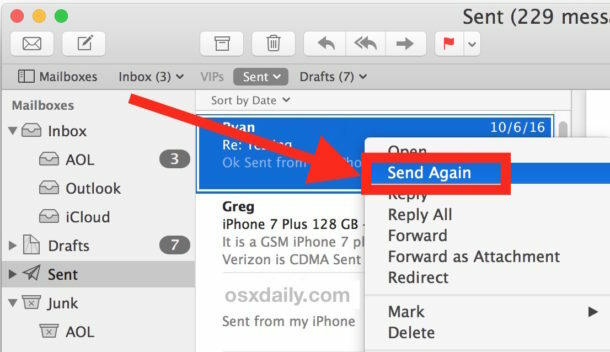 The Send Again option is available on all modern versions of the Mail app for Mac OS and Mac OS X. You can also re-send an email message by right-clicking on the email and choosing “Send Again” from the available menu items. And for keystroke fans, if you select an email message and hit Command + Shift +D the Send Again option will also trigger, and you’ll have the same email message appear to edit, modify, and send on its way again. This obviously applies to the Mac Mail client, but the iOS Mail app doesn’t have the same feature currently, instead users would either have to copy and paste an old message to resend it or, if the email is stuck in the outbox force it to send again. Yes, it is available in iOS. Select a message in the ‘Sent’ folder, touch the curved ‘Send’ arrow and ‘Send again’ is one of the available options displayed there. In doing this would the receipient get 2 of the same email? Or would the new one replace the older one in their in box unless they had already deleted the First one. If they received the first email then yes they would get it again.